Joan & Sandy. Joan & Sandy in a restaurant. 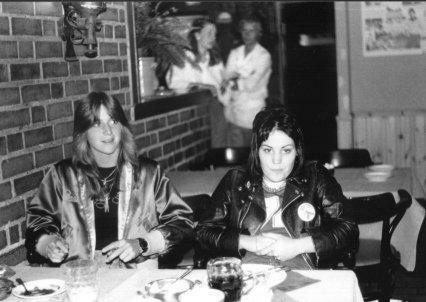 Wallpaper and background images in the द रनअवेस club tagged: the runaways image joan jett sandy west restaurant. This द रनअवेस photo contains चोली, ब्रासेरी, खाने की मेज, and बिस्टरो. There might also be रात का खाना, सड़क, शहर के दृश्य, शहरी सेटिंग, शहर दृश्य, शहरी की स्थापना, हस्ताक्षर, पोस्टर, पाठ, चॉकबोर्ड, साइन, and साइन इन करें.